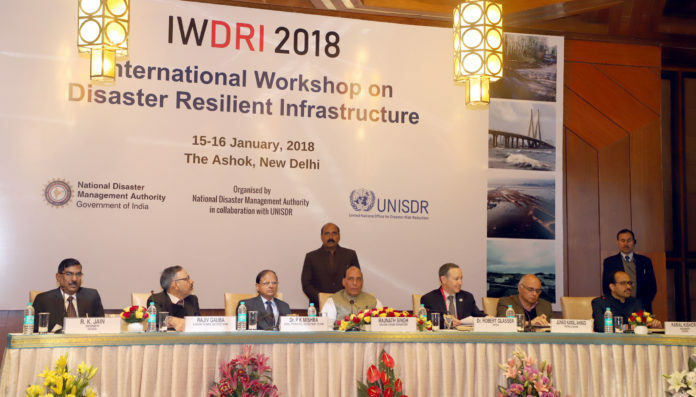 The Union Home Minister, Shri Rajnath Singh at the inauguration of the International Workshop on Disaster Resilient Infrastructure (IWDRI), in New Delhi on January 15, 2018. The Additional Principal Secretary to the Prime Minister, Dr. P.K. Mishra and the Union Home Secretary, Shri Rajiv Gauba are also seen. New Delhi: Union Home Minister Rajnath Singh inaugurated the International Workshop on Disaster Resilient Infrastructure (IWDRI) here today. The two-day workshop is being organised by the National Disaster Management Authority (NDMA) in collaboration with United Nations Office for Disaster Risk Reduction (UNISDR). Reiterating India’s commitment towards building resilience and strengthening global cooperation, Shri Rajnath Singh talked about the Prime Minister’s 10-point agenda, outlined during the Asian Ministerial Conference on Disaster Risk Reduction (AMCDRR) held in New Delhi in November 2016. “At that conference, our Prime Minister outlined a ten-point agenda to give a sense of urgency to the implementation of Sendai Framework for DRR. His 1st point emphasized the need for investing in infrastructure in a manner so that it can withstand hazards not only now but also in the future,” he said. Shri Rajnath Singh also recalled the example of constructing sound structures in India’s ancient civilizations. “Infrastructure has shaped human civilization for millennia. Our forefathers showed tremendous foresight when they developed infrastructure that served us for generations,” said Shri Rajnath Singh. “They have helped us tame the fury of nature, while also helping us maximize the benefits of mother nature’s benevolence,” he added. The Union Home Minister said robust infrastructure will be at the core of sustainable development in the coming decades; this is also recognized in the way the (United Nations’) Sustainable Development Goals have been framed. “The infrastructure that we will build in the next twenty years will be more than what we built over the last two thousand years. At the global level, by 2040, to adequately meet the infrastructure needs of humanity, we will need nearly $100 trillion. By 2030, Asia alone will need $26 trillion in infrastructure investment,” he said. Shri Rajnath Singh said climate change is also posing new challenges to erecting Disaster Resilient Infrastructure. “Climate related extremes are likely to become more intense and frequent. Past is no longer a good guide for the future,” he said. “The challenge of building Disaster Resilient Infrastructure is such that no country can address it alone,” he added. Speaking on the occasion, Dr. P.K. Mishra, Additional Principal Secretary to the Prime Minister, said that while reducing losses to infrastructure is one of the specific targets identified under the Sendai Framework for Disaster Risk Reduction (SFDRR), 2015-2030, it is also key to achieving other targets identified under the SFDRR. “We cannot reduce the number of deaths, reduce the number of affected people, or reduce economic losses from disasters if our infrastructure is damaged and its functionality disrupted by disasters,” he said. Highlighting India’s reconstruction experience after the Bhuj earthquake, Dr. Mishra said that rebuilding to appropriate standards of disaster resilience also delivers co-benefits in terms of improved quality of life. “Investment in Disaster Resilient Infrastructure should be seen as an investment in sustainability,” he said. In his address, Shri R. K. Jain, Member, NDMA, highlighted the importance of collective efforts towards mainstreaming disaster risk reduction in infrastructure. “This workshop is a unique opportunity to exchange ideas and explore collaborative initiatives,” he said. Special Representative of the UN Secretary-General for Disaster Risk Reduction, Dr. Robert Glasser said the pace of urbanisation around the world today is an opportunity to not only avoid creation of new risks but also to reduce future losses. Shri Junaid Kamal Ahmad, Country Director for the World Bank in India, emphasised upon the need to leverage the financial market to build financial resilience in today’s world. He also highlighted the importance of institutional mechanisms, federal structures and financial provisions in building resilience in infrastructure. Union Home Secretary Shri Rajiv Gauba was also present during the inaugural session. Experts from about 23 countries, multilateral development banks, the United Nations, the private sector, academia and other stakeholders are participating in the workshop. Deliberations at the workshop will take the dialogue on Disaster Resilient Infrastructure and global cooperation further. It will also help foster a sustained dialogue and mutual exchange of experiences, lessons and solutions.